Depending on the client and his challenge we select the right Agile approach. Most times, that’s Scrum. Why? It sets the basis for a pleasant client-agency collaboration and the quality goes up. Starting from sprint one, we immediately begin building tiny pieces of software that are visible and valuable. Scrum is all about transparency. Something we achieve through the use of physical whiteboards and digital tooling, as well having all scrum events via digital conference channels. 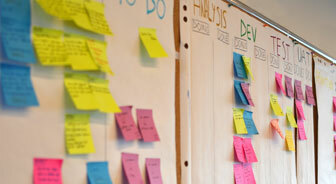 It’s a challenge, but at rb2 we’ve become experts in offline scrum events. Our Scrum teams consist of the development team, including the Scrum Master, coached by a Delivery Manager in the Netherlands. A representative of the client serves the Product Owner. Our clients have the domain knowledge that we do not have (yet). Our Delivery Managers and Technical consultants are eager to help with Product Backlog Management and making technical decisions. During Sprint Planning the team, preferably including the Product owner discuss and select the Product Backlog Items to work on. The developers immediately draw up an action plan to get these tasks 'Done'. Of course, adhering to the Definition of Done. We have a rb2 standard for this, which we tweak together with the customer. On each following day, the team holds its own Daily Scrum. This takes place offline within the Chinese office. Any impediments are raised to the Product Owner and/or Delivery Manager. Halfway through the sprint, the Scrum team makes time for Product Backlog Refinement, in which the development team spars with the Product Owner about items that are lower down in the backlog. This helps the Product Owner to create a long-term planning forecast. The last Friday of the sprint is a busy day. It starts off with the Sprint Review. This is a conference call with the entire Scrum team and client-side stakeholders, and its aim is to reflect on the sprint delivery. It's not a demo, but an interactive session in which all aspects (technical and functional) of the product are discussed. By this time, the Product Owner also has all their Product Backlog items ready for the next sprint. The sprint ends with a retrospective. 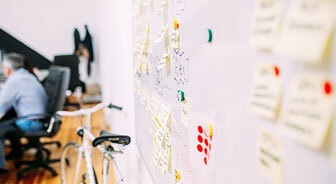 With the whole scrum team, including the client-side Product Owner, we’ll look back at the sprint and ahead for ways to optimize the process and continuously improve ourselves. Learn more about this subject?